Here are some more pictures from Saturday, courtesy of Tony’s and Stef’s much nicer camera. On Saturday the Red Yarn Puppet Band had its second legit performance, this time supporting a great Portland band called Pancake Breakfast at their album release show. I met Mike Midlo–PB’s leader–through mutual musical acquaintances, and we immediately connected over our appreciation of animals in folk music. 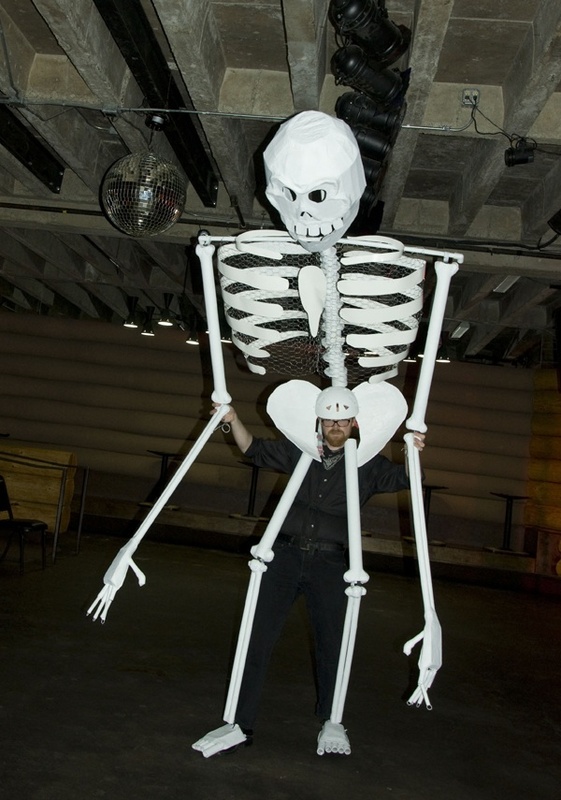 Mike saw pictures of a 15-foot puppet I made for my friend’s birthday last year, and asked if I could do something similar for his album release show. We chose two PB songs that lent themselves to puppetry–“Pedro Infante,” about the ghost of an old Mexican actor, and “Pea Green Boat,” a play on the nursery rhyme about an owl and a cat in a little boat. The Red Yarn P uppet Band set to work building puppets. Tony and Stef made an amazing cat and owl; Jessie built a fish and a seagull on rods; I spent the last two weeks constructing an 11 foot skeleto n puppet (the bones of Pedro Infante). For the spinal cord and support piece, I mounted a PVC pipe on a backpack and bicycle helmet. The arms were made of cardboard and bicycle tubes. The fingers were small plastic tubes with a wire and rubber band trigger operation system. I made quite a mess of our sun porch. We had our puppets and props mostly built by Saturday, the day of the show. Tony came over and we put the finishing touches on the skeleton and a backpack-mounted pea green boat (a kind of mobile puppet stage with a cutaway bottom… Tony wore it and Stef stood right in front of him so the owl and cat could sit in the boat). 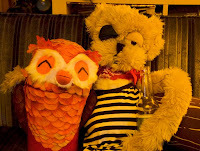 We headed to the venue early, to make sure our puppets would actually fit in the door. 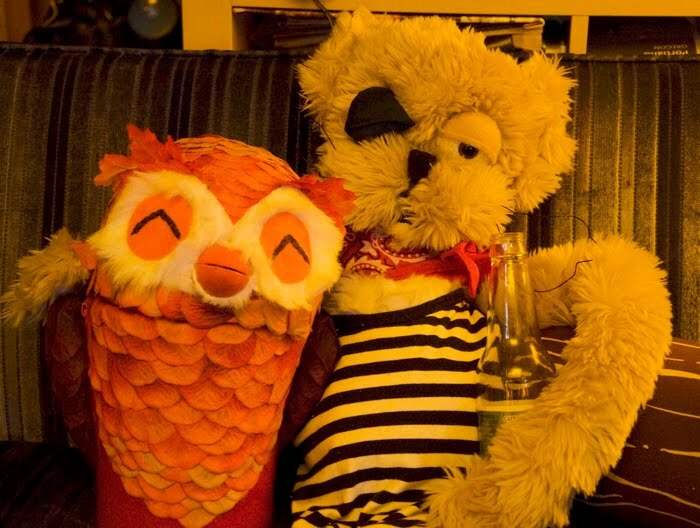 The puppets got friendly with the band backstage. It was an amazing line-up–a great folk/soul band called On the Stairs opened, then a dance troupe called Trip the Dark Fantastic cleared the stage and performed a 30 minute dance piece. The crowd ate it up. It was interesting to study people’s reactions to the giant puppet. I think a lot of folks go to shows to passively observe the action, and some seemed disconcerted to have to interact with the performance. It was in their best interest, considering that I might have collapsed on them at any point, or smacked their faces with Pedro’s jangly finger bones. Pancake Breakfast closed their set with “Pea Green Boat.” Stef and Tony emerged from the green room in the boat, followed closely by Jessie with the bird and fish. During a soft, spooky breakdown, the skeleton reemerged to dance with the boat. Neither Tony, Stef, Jessie or I could see what was going on from beneath our puppets. 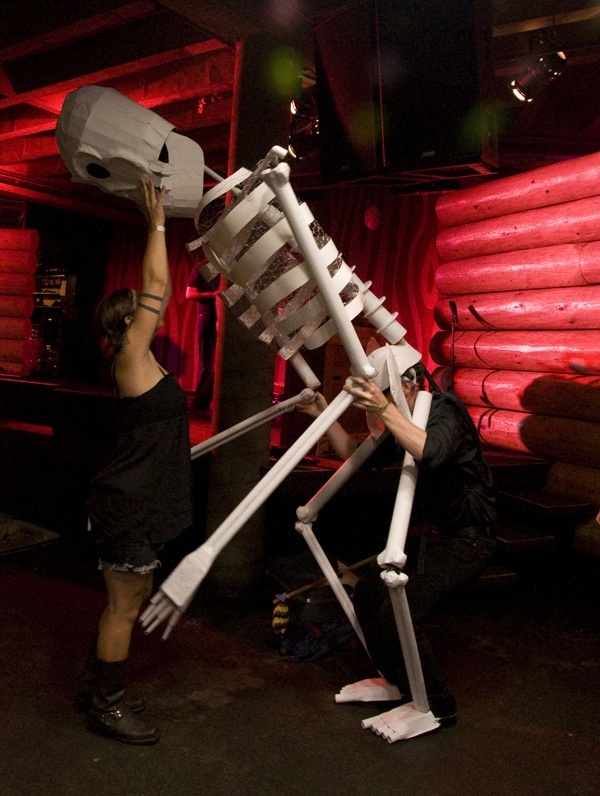 At some point the skeleton’s rib cage fell off… as the song ended I collapsed on the floor in a pile of bones. All in all, it was a great performance and a huge learning experience. Tony, Stef, and Jessie blew me away as usual with their puppet-building and operating skills. I was happy that no one, including myself, was hurt by the giant skeleton in the room. Mike and the rest of Pancake Breakfast seemed pleased with the puppets, and I hope that it added a little bit more magic to an already magical night.